I originally worked as an painter/print-maker, before turning increasingly to collaborative book work in the 1990s. I found out about ‘deep mapping’ as specific practice quite late, and rather more by luck than judgement, but had somehow arrived at something very similar around 1999. 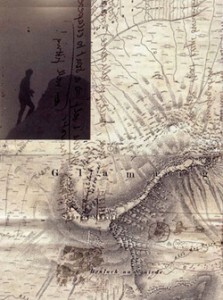 At that time I begun working in a way that sat more more less midway between the performance-based deep mapping or theatre/archaeology developed by Mike Pearson, Cliff McLucas and Michael Shanks, and the ‘literary’ approach used by William Least Heat-Moon for his 1991 book PrairyErth: A Deep Map. My way of working – through long, interlinked series of mutating images – is also influenced by the painter Ken Kiff’s wonderful Sequence (on which I produced a book), and by contact with supportive ethnographers and cultural geographers. 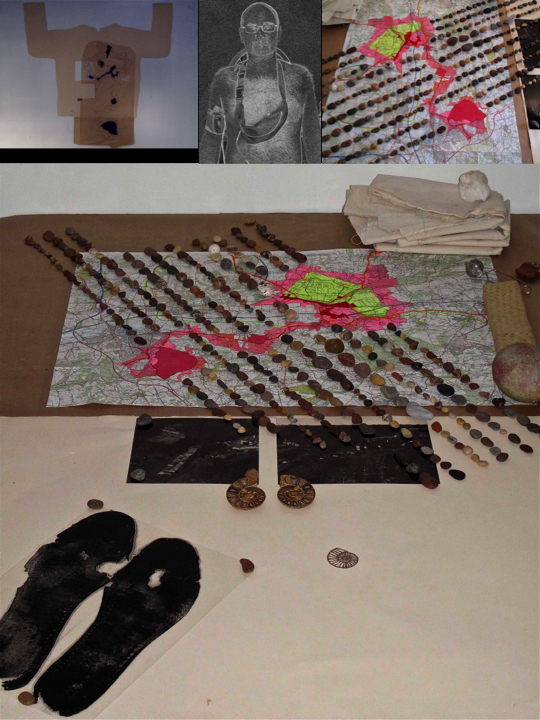 By the late 1990s I was regularly working on collaborative projects – with graduate students (the Bedminster Memory Map was the first of various commissions from Lloyds TSB), but also with an alter ego so as to explore issues of identity. In the summer of 1999 I started the Sowdun project, which would later mutate into the more expansive Debatable Lands project. Both are based on exploring a particular physical region – through walking, fieldwork and historical and ethnological research – and then allowing serendipity to kick in. The Sowdun project really took off, for example, when I noticed the gap between the cartographic representation of an archeological site in the small former parish in the English/Scottish Borders region and what actually happened ‘on the ground’. That gap then became linked to the tension between ‘fact’ and ‘fiction’ in relation to the ‘supernatural’ ballad Tam Lin. I was very fortunate that the first of the four book works – Between Carterhaugh and Tamshiel Rig: a borderline episode (2004) (see http://www.land2.uwe.ac.uk/essay18.htm) – to eventually come from the Sowdun/Debatable Lands project came to the interest of an informal group of ethnologists through Ullrich Kockel, at that time a Professor of Ethnology at UWE, Bristol. Their interest helped both my thinking and my confidence, and so the book became the practical basis for my PhD. Exchange with this small group convinced me that I had found a valid form of open-ended, hybrid practice that would sustain my own creative interests. It also provided a degree of leverage within an increasingly constraining academic context where it was already apparent that the Research Assessment Exercise was going to militate against genuine trans-disciplinary work. Since then I’ve published three other book works related to this same project, all with Wild Conversations Press. I might easily have remained in ignorance of deep mapping but, between September 2006 and August 2008, I found myself acting as the UWE co-coordinator for an AHRC-funded network after someone else dropped out. Living in a material world: A cross-disciplinary location-based enquiry into the performativity of emptiness included staff from the universities of Bristol, Aberystwyth and UWE and included Mike Pearson. This contact – and the rich exchanges within the network of which it formed one part – allowing me to locate my particular practice historically – as an ethnographically inflected version of theatre/archaeology within a larger ‘deep mapping project that I see as including works such as the visual artist Lewis DeSoto’s Tahualtapa Project on one hand and that of Shanks, McLucas and Pearson on the other. 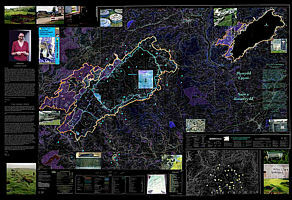 Of the work that came out of my engagement in that network, three examples are included on this web site – Hidden Wars (2008) and two small ‘performed interventions’ related to my developing thinking of deep mapping – one undertaken at the army training center at Mynydd Epynt and a second at Avenmouth, later used to develop work relating to the western seaboard of the British Isles – On Western Edges (2009). More recent projects, like Terra Incognita and work done in Cornwall, have their own pages here. I’m currently working on thinking through the relationship between deep mapping and Felix Guattari’s thinking in his Three Ecologies. While the Debatable Lands project continues, I have also taken deep mapping into other contexts. 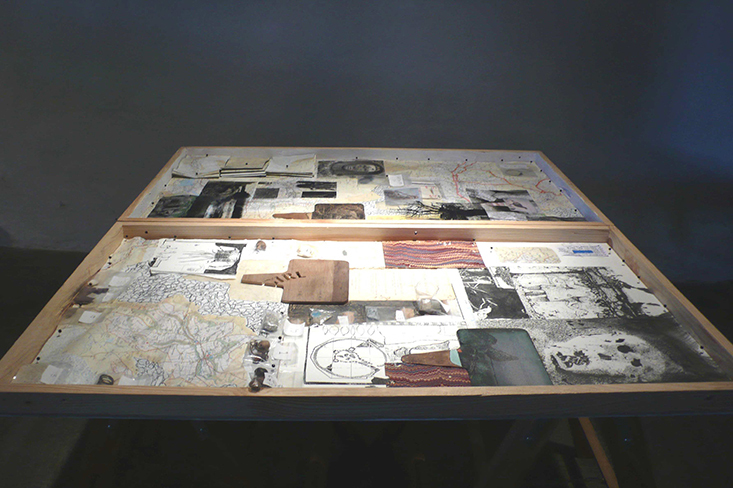 In 2008 I became a member of a large interdisciplinary project Grey and Pleasant Land? An Interdisciplinary Exploration of the Connectivity of Older People in Rural Civic Society. I worked with a small team of four – including the artist Jane Bailey www.janebailey.co.uk – using deep mapping to explore the connectivities in play in rural communities as experienced by older people through a project entitled: Either Side of Delphy Bridge. The Debatable Lands project has recently bifurcated, producing both time-based work – Uplands and Between – and the wall-based works Terra Incognita (all grass is flesh) with (and for) Anna Boulton Biggs (2010) and Notes towards a deep mapping (2012), which relates to a projected ‘novel’ intended to conclude the Debatable Lands project.